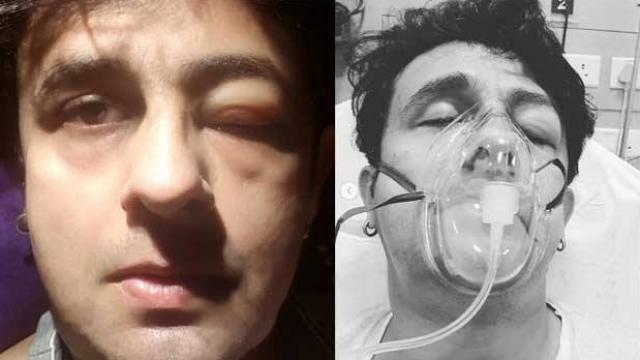 Mumbai: Singer Sonu Nigam on Thursday shared rather disturbing pictures of himself on Instagram and informed that he has been hospitalised due to a severe food allergy, a day ahead of his concert in Odisha’s Jeypore. The 41-year-old singer visited Odisha’s Jeypore on Tuesday to perform at a concert organised by Biju Yuva Vahini, youth wing of the Biju Janata Dal (BJD) which holds power in Odisha at present. The singer wrote that he was rushed to Mumbai’s Nanavati Hospital after suffering an acute case of sea food allergy. Sonu Nigam said he had difficulty in breathing and the photos reveal that his left eye got massively swollen as an allergic reaction. Despite being hospitalised, the singer recovered well in time for his performance in Jeypore and thanked his fans for the well wishes. Taking to Instagram, Sonu wrote- “Thanks for your concern and love. Now that you know that I am returning back from Jeypore Orissa after managing a concert last night, I now don’t mind sharing how I was the day before yesterday,” he wrote. “Lesson for all of us, never ever ever, ever take a chance with allergies. Seafood in my case. If Nanavati Hospital wasn’t nearby, my trachea would have swollen up further and lead to asphyxiation. Happy and Healthy life to everyone,” wrote Sonu.